"Dear Christian youth, you were a faithful follower of Christ in the Society of Jesus. You steadily strove for perfection while generously serving the plague-stricken. Help our youth today..."
St. Aloysius of Gonzaga was born in Castiglione, Italy. As the eldest son of the Marquis of Castiglione, an Italian nobleman, his father had great hopes that he would embark on a military career. From the age of four, his father took him on military training expeditions. But Aloysius was also deeply faithful, pious and given to prayers. He contracted malaria at the age of seven. It was during this time that he was converted from the worldly and courtly way of life to the interior life. By the age of ten, he had privately decided on a religious life and made a firm determination never to offend God by sin. He developed an affinity for study of the saints, and recited the psalms daily. He received his First Communion from Cardinal Charles Borromeo of Milan at the age of twelve. After that he looked forward to weekly Communion (daily Communion was not then the custom). He also fasted three days a week and meditated morning and evening. At the age of fourteen he was convinced that the princely life of honour and riches was not for him. He thought of becoming a Jesuit and this desire was confirmed when he was fifteen, while praying before an image of Our Lady in a Jesuit church. After much opposition and unhappiness from his parents, he finally obtained his father’s consent to enter religious life, having renounced his inheritance in favor of his brother. He became a novice at seventeen and a half, after presenting himself to Father General Claudio Acquaviva. The maxim that led him to the novitiate remained with him throughout his years: “I am a piece of twisted iron; I entered religion to be untwisted straight.” Aloysius gave himself totally to the process of becoming a Jesuit. He was an excellent student with a penetrating mind. When famine and plagues broke out in Italy, Aloysius, then studying Theology, begged alms for and worked with the plague-stricken. Those he found dying in the streets, he carried to a hospital, washed and fed them and prepared them to receive the Sacraments. He caught the plague a year later and was confined to bed. He received a revelation in prayer that he would not live long and would die on the octave of Corpus Christi. The young twenty three years old Aloysius died that evening with his eyes fixed on the Crucifix in his hands. The last word he spoke was the holy name of Jesus just as the first words he spoke as an infant were the holy names of Jesus and Mary. St. Aloysius makes a great example for our youth considering he faced the same kind of challenges they do today such as peer pressure, struggles with remaining pure, and difficulties in choosing and pursuing a vocation. 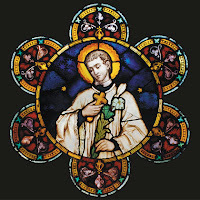 Despite being among very rough and impure people, and despite great parental objections , St. Aloysius maintained a pure heart and became a Jesuit priest.